RESTORATIVE YOGA IS A DEEPLY THERAPEUTIC FORM OF YOGA THAT PROVIDES DEEP REST FOR TIRED BODIES, RELAXATION FOR BUSY MINDS, AND a CONSCIOUS connection with the breath. restorative yoga is a powerful tool in relieving the negative effects of stress, strain and stimulus overload, rife in our modern world, and brings about a relaxed, grounded, and centred state of being. Restorative yoga is a more passive type of practice. Classes will begin with gentle and sometimes long held stretches, before moving through a sequence of reclined poses where the body is held by strategically placed props. These props aid in the relaxation process by supporting the body in twists, inversions, forward folds and gentle back bending positions so that it can feel secure enough to relax and then to release. Each restorative pose can be held for around 5-8 minutes which truly gives the body, mind and nervous system time to readjust right down to the cellular level. This is a profound practice which challenges the individual to explore stillness, silence, and the art of letting go. 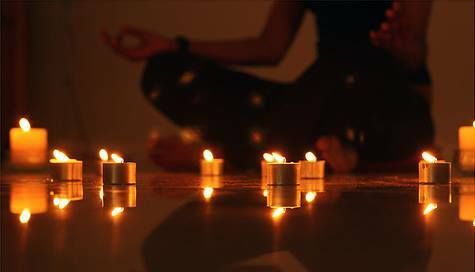 Practiced in candlelight, this monthly mini retreat is the perfect way to deeply nourish and nurture yourself, giving you a chance to re-balance from the frantic activity of daily life.